Caribbean Airlines wants TT to know that there is no promotion on at the moment and it is no way affiliated with or connected to the website caribbeanairline-com. A press release was issued on this after it was discovered there was a fake website saying the airline is celebrating its 12th anniversary and giving away two free tickets to everyone. The fake website has the Caribbean Airlines logo and said there were 51 remaining tickets to give away. The website then asks five yes and no questions. After answering the questions the website guides the visitor to share the site with 20 friends or groups via Whatsapp. It then asks the visitor to click on a claim tickets link and enter details. After which, it tells the visitor that tickets will be received in three days. The fake website also shows 17,259 Facebook reactions and has fake comments from visitors to the site. The airline’s corporate communications department issued a release yesterday saying “Caribbean Airlines advises that it is not running any competition or promotion giving away free tickets at this time. Caribbean Airlines is in no way affiliated with or connected to any website or organisation using http://www.caribbeanairline-com.win/. 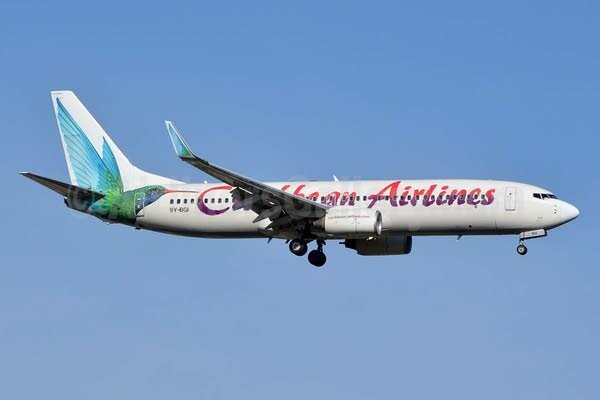 “The airline is unaware of the owners of this website and are advising its valued customers that any information shared on that website is not being shared with Caribbean Airlines. “Caribbean Airlines is urging its valued customers to please be aware of impersonators who may be seeking to access and use your personal information. Please keep your information secure. Immediate action, she said, was taken and the “disclaimer” issued. She stressed that Caribbean Airlines was not the only airline to experience this in the last couple of days. Asked if the airline has been able to track the source of the fake website, Ligoure said the airline has notified all of the relevant people whose responsibility is to do that. She also stressed, repeating multiple times to Newsday, that “our website is safe and secure. I repeat our website is safe and secure and not compromised because it was not our website that was utilised. “The release clearly indicated that the website that was being used is in no way affiliated with Caribbean Airlines.” Ligoure also pointed out that there are several clear differences between the real Caribbean Airlines website address and the fake, one among them being that the fake website does not have the s at the end of airline. The real Caribbean Airlines website has an s at the end of the word airline (airlines) in its web address and the fake one does not. Reply to "Caribbean Airlines hit by phishing attack"